Do you have one of those tried and true dishes you have been serving for so long that you can’t remember ever not having it in your pantry? 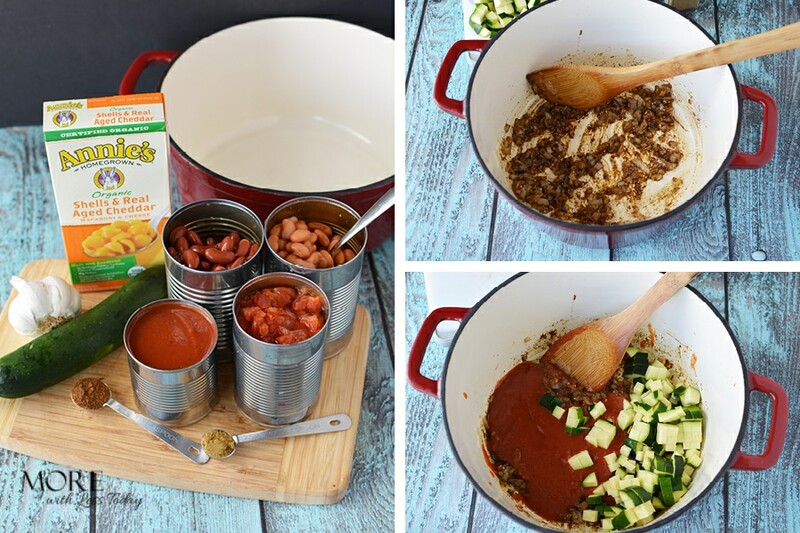 When you don’t know what to make for dinner, give this Vegetarian Macaroni and Cheese Chili Recipe a try! This post is sponsored by Acorn Influence. All opinions are 100% my own. For me, it is Annie’s Organic Macaroni and Cheese. It’s one of those wholesome comfort foods that makes everyone feel good. Last week, I served it as usual, as a side dish with dinner. As usual, everyone ate it first and wanted seconds. Silly as it now seems, I never thought to make Annie’s Macaroni & Cheese as a main dish. Yesterday I experimented with making a vegetarian chili by adding a few simple ingredients along with Annie’s Macaroni and Cheese and wow, it was a huge hit. It’s so easy, cheesy and delicious that I’m excited to share my recipe. Next time, I need to make a double batch so we can enjoy the leftovers. Take some to work in a Thermos for a very satisfying lunch. Heat the olive oil over medium-high heat on the stove top in a large frying pan. Add the diced yellow onion and the garlic about 4 minutes, stirring frequently to avoid sticking. Add in the cumin, chili powder, salt, and pepper and stir about 1 minute. Add the chopped zucchini and tomato sauce and continue to stir for about 3 minutes. Next add in the black beans, pinto beans, and the diced tomatoes. Add 2 cups of water and bring your mixture to a boil. Then reduce the heat and simmer about 20 minutes until the zucchini is soft. While the mixture is simmering, in a separate pan, cook Annie’s Organic Macaroni and Cheese according to package directions. 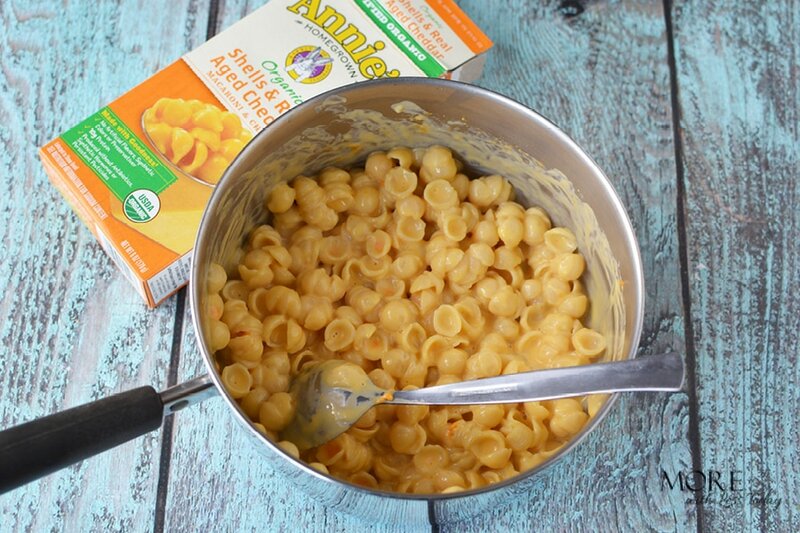 Once prepared, add the Annie’s Macaroni and Cheese into the mixture and stir thoroughly. Spoon into bowls and top with avocado, cheddar cheese, and sour cream. Serve immediately and enjoy! Find the healthy and delicious products you need at Sam’s Club. You can count on them to help you to incorporate natural and organic products that go beyond the deli as well as wholesome pantry staples like Annie’s. At Sam’s Club, you can order online and then pick up in store and have them help you load it into your car. Be sure and give this fantastic time-saving service a try when you are short on time. That sounds like an awesome dinner idea. My kids are going to love this. What!! I love this. I love that you added the mac and cheese to that chili. what a great idea. mmmm. This sounds great for dinner. My kids love mac and cheese so I need to make this. Ooo this looks so delicious! I love anything with macaroni and cheese. That sounds really tasty. When I was a kid, we used to have chili suppers at my local church to raise money for our various summer projects. We did this once a month, and I clearly remember the first time I saw someone add pasta to chili. That was foreign to me at the time as my family’s recipe doesn’t do that. I’ve since embraced it and come to love it. 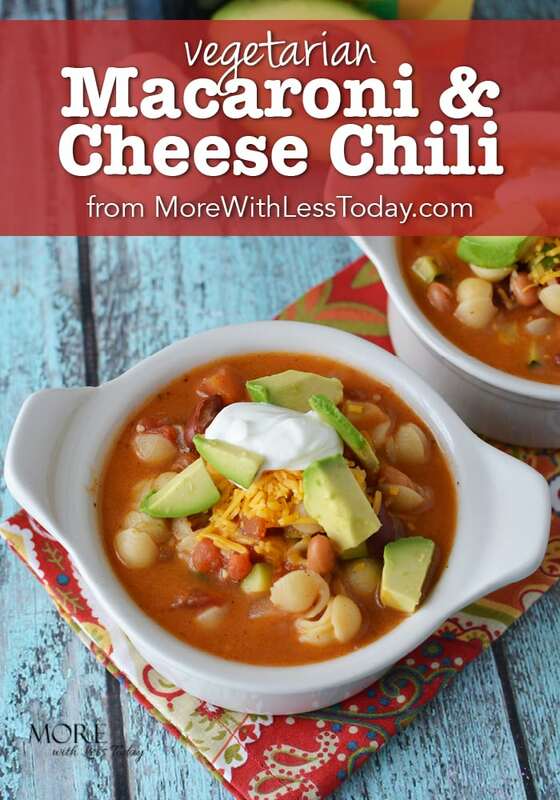 AND of course, I love my chili with cheese, so this sounds really appealing! Oh this looks so nice! I love mac and cheese, who doesn’t, but this is such a nice twist on it! Macaroni & cheese has always been a family favorite … and easy to keep it vegetarian. Think my favorite part is putting avocado on top … never thought of that. 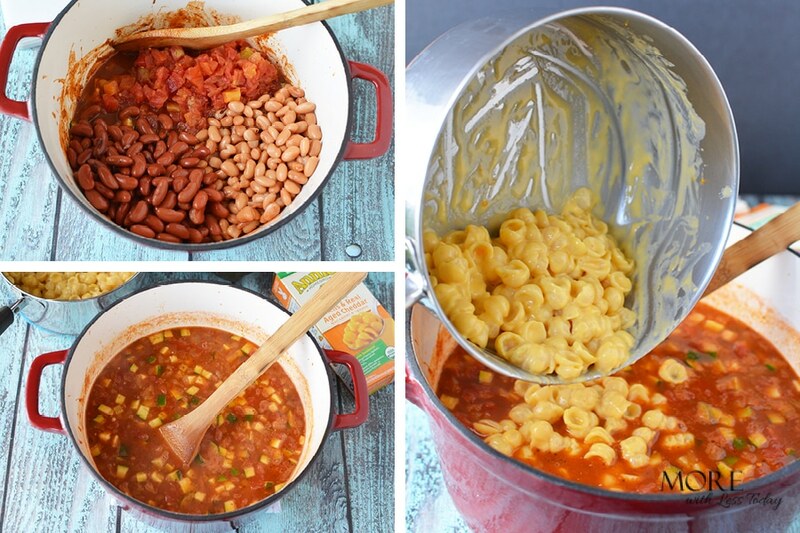 Wondering if you can make 3 meals at the same time – mac & cheese, chili & your combo … one cooking project & diner for 3 nights? I love that idea Tina!